Mississippi, U.S.A. — a 30-minute TV news report first aired 55 years ago — is a significant new addition to the visual history of the Freedom Rides, and a stark portrait of Jackson on the verge of great change. The news report covered the arrival of the first Riders into Jackson on May 24, 1961. It was produced by WKY-TV, the NBC affiliate in Oklahoma City. I recently came across a link to it on Twitter; it’s been on YouTube for about 18 months, part of a collection of early TV news from WKY. What makes Mississippi, U.S.A. so valuable? It has the first footage I’ve ever seen of the Riders at the Greyhound station in Jackson, and more footage than I’ve seen before of the Riders at the Trailways station. Why was a local Oklahoma TV station in Jackson to cover the Rides? I don’t know yet. I do know that Scott Berner, one of the report’s producers, had worked in news at a TV station in Montgomery in the late 1950s, so presumably he would been aware of the movement and been paying attention as the Riders headed south from Washington, DC, in early May 1961. The arrival of the third bus, four days after the first two, meant the Riders had abandoned their original destination of New Orleans in favor of “jail, no bail” in Jackson. But the WKY story doesn’t catch the shift in strategy (even though it does accurately report that most of the Riders had refused to bail out). As a piece of early TV news, the WKY report is fascinating for its repeated use of “Dixie” as a soundtrack, especially during the several-minute montage showing the Riders at the two bus stations (from 10:10 to 14:28). Houston Hall … when I started in the business that name was the equivalent of Babe Ruth in baseball. Houston was a rich kid from Oklahoma City who talked his parents into buying him a professional film camera when he was in his teens. He did some stringing and then was hired by WKY in Oklahoma City around 1960. I can’t prove this but I believe that Houston may be the inventor of the sequence as it applies to television news. He was (and is) a master of our craft and an artist to boot. Thanks to Hall, Scott Berner and co-producer Gene Allen, we now have this incredible record of the Riders in Jackson. 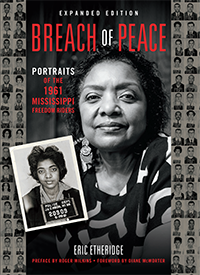 Their reporting and analytical shortcomings notwithstanding, this is a great addition to the history of the Freedom Rides, a wonderful gift on the campaign’s 55th anniversary.